This review is sooo long overdue but here goes… I bought the Boba Carrier in 2013 at a baby fair so mine’s the 3G version. Started using it when Naila was 4 months old eventhough we bought it before she was born. I joined the babywearer’s FB group shortly after.. and found out that SSCs (soft structured carriers) aren’t suitable for babies below 4 months old because the baby’s back isn’t strong enough yet. So for the first 4 months, I used the Boba wrap, which I’ll also do a short review later. First of all, I love the carrier because it was so easy to put on. This is super important because I use the carrier everyday by myself. Even when you switch the carrier to another person, the straps are easy to adjust. You can get it done less than 5 minutes. When I started using the Boba Carrier I thought it’s super comfy. The carrier fits my 5’2 frame just nice and hugs the baby. Naila was so comfortable in it that whenever I put her in, she’d quickly fall asleep! Alot of people commented on how Naila is a ‘good’ baby. But believe me, she’s only like that when in the carrier. I am a work at home mom, and I used to take Naila out everyday… So you could say that I’m a heavy user of the carrier. It’s the ONLY carrier that I used for 1 and half years and the carrier still looks good and wears well! The material is sort of like canvas, very hardy. It has a hood which was SO SO useful when baby is asleep. There’s also a small pocket on the bottom of the carrier which comes in handy sometimes. Check out the padding on this thing.. so thick! It was like lugging a bag instead of a 8kg baby. When I’m alone, I usually prefer to use the Boba carrier. I mean, you can imagine having to carry a 7kg stroller and a 7kg baby at the same time.. Not pretty. So yeah the Boba carrier is a staple in my car.. I never took it out. Around 5 months old, Naila decided that she hates the stroller. So even hubs started carrying her in the carrier. Hubs is about 5’8, with a way bigger frame than me but the carrier can be adjusted and is also very comfortable for him. Naila was 5 months old in the pic. Although, when hubs is wearing the baby, her legs tend to be splayed out more. And she seems to sink a little in the seat. I think it’s because hubs tends to wear it a bit lower on the hips. But again, in the carrier, Naila NEVER complains or cries. She just happily looks from side to side. I know some parents prefer the forward facing carriers, and sometimes say their babies prefer it too. I think because I exposed Naila to this position since she was a month old, so she loves it! I also think that forward facing is a bit scary for small babies. Like, they’re more protected by facing in. I don’t know. Maybe I’m just paranoid or something. 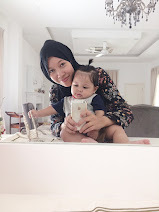 When Naila was 5 months old, we started travelling around Malaysia. We took her to Cameron Highlands. Cameron Highlands has a cool weather, so walking outside is a breeze. We walked along the morning and night markets, did sight seeing around the orchids while wearing her. Me and hubs alternate wearing her for a few hours. She simply drifted in and out of sleep. Again, no complains! And Naila is so NOT the docile baby type. That’s why I love wearing her. She just simply switches on to zen mode in the carrier. The personality change is so obvious it’s funny. 7 months old Naila under the hood. Carrying her at the beach with my trusty tan Boba carrier. Baby almost falling asleep in the carrier. Oh yeah! Did I mention you can wear the carrier on the back? When Naila was about 10 months old and VERY heavy, I started carrying her on the back. What could I say? A weight was lifted. I was carrying a normal backpack except that the content was breathing. One more thing I like about the carrier is that it has the strap to hold your handbag in place. OMG I am so thankful for this feature! This isn’t my photo, but I’ll just use it for demonstration purposes, just to show you where the strap is. The strap is a lifesaver. Imagine carrying a baby and having to adjust your handbag every few minutes. It’ll get annoying pretty fast. With the strap, your handbag is held in place forevermore. Love it. The only thing that I’ve never done in the carrier is to breastfeed. Maybe it’s just me but I don’t feel comfortable enough to breastfeed on the go. Somehow feels very exposed even though I know zillions of moms out there who successfully breastfeed while wearing the carrier without no one even noticing. When I set out to look for a carrier, I wanted it to be convenient, ergonomic, reliable, hardy, comfortable and that baby loves it. I found all that in the Boba carrier. If this was a car, I’d equate it to be like a really reliable Toyota. No fuss, easy to find in stores and the price is reasonable considering that I’ve been using it for the past 2 years. It transits well from babies to toddlers. All in all, 5 stars for the Boba Carrier.